Copyright Roger F. Vaughan. Used with permission. 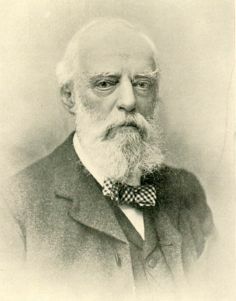 William Blanford's studies as a geologist in the South Asian subcontinent over the middle third of his life extended practically to the region's geographical entirety. His first well known publication, however, described an expedition to Abyssinia he joined in the late 1860s; it came out in 1870 as Observations on the Geology and Zoology of Abyssinia. After retiring from the Geological Survey of India he returned home to England, where he became involved in the Fauna of British India project as editor, and from time to time wrote on the regional biogeography of South Asia. Blanford's main taxonomic specialty was nonmarine molluscs, but he also contributed studies on birds, mammals, and plants, alive and fossil. Early in his career he recognized ancient evidence for glaciation in India, one of the first workers to find such in a non-northerly locale. --born in London, England, on 7 October 1832. --dies at London, England, on 23 June 1905. --Proceedings of the California Academy of Sciences 55, Suppl. 2 (2004): 117-137. --Geological Magazine, New Ser., 5th Decade, Vol. 22 (1905): 1-15. --Proceedings of the Royal Society of London, Series B, Vol. 79(535) (1907): xxvii-xxxi.